This is just in. 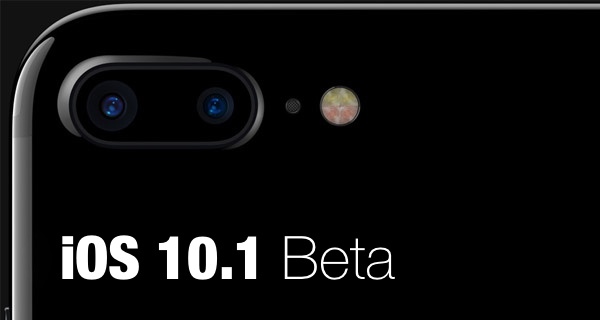 Apple has just made available to download iOS 10.1 beta 3 to developers about one week after seeding beta 2 to both developers and testers, and around a month after introducing iOS 10.0.x to the public. The great news for iPhone 7 Plus owners is that the release of iOS 10.1 is predominantly focused on introducing, fine-tuning and getting the new Portrait mode perfect for those who can take advantage of Apple’s new dual-lens camera system. This latest software update, as discussed by Apple during its September 7 iPhone 7 event, uses software techniques to harness the power of Apple’s new dual-lens camera system to capture stunning images with depth-of-field bokeh effect that have previously only been available on DSLR cameras. The feature may look simple in its use, but it actually uses processing intelligence to decide exactly what parts of the image to blur based on distance from the focus object, which could be a person, pet, or other type of object. In addition to adding this feature, this latest beta focuses on improving the core stability of iOS 10.1 as well by introducing bug fixes where necessary and ensuring that the overall experience is as smooth and fluid as it can be. These bug fixes include issues that have been found in previous version of iOS 10.1, as well as issues that have been present ever since the launch of iOS 10.0.x back in September. Taking iOS 10.1 out of the equation, iOS 10 in general introduced support for Siri within third-party apps, as well as a totally revamped messaging experience that includes full-screen and message effects in the native Messages app, and much, much more. Apple has also built the notification system from the ground up to introduce a richer, more interactive system, among other things. 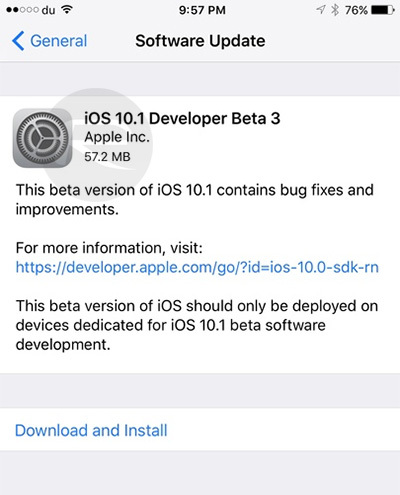 As always, registered developers can grab iOS 10.1 beta 3 as an over-the-air download from Settings > General > Software Update section of iOS if a previous beta version is installed on the device, or if a beta configuration install profile is present as offered by Apple through the developer portal. Beta 3 IPSW file is also available to download directly from developer.apple.com for those who want to install it manually using iTunes as a fresh install. Update: Apple has also released tvOS 10.0.1 beta 3 to developers. Does 10.1 beta 3 make your phone explode? This was also a public beta release as well. iOS 10 has now 67% install base.